Fashion brand Annapurna was at Pitti Uomo to present its beautiful and colourful men collection for autumn-winter 2013-2014: the special capsule collection "Noi li pettiniamo" (We do comb them)features pure angora garments, while the main line, inspired by Pablo Picasso, is quite quirky and flamboyant. Annapurna's mini angora collection offers soft sweaters, made using a unique, eco technique: the fibre has been obtained by simply combing the rabbits' fur. 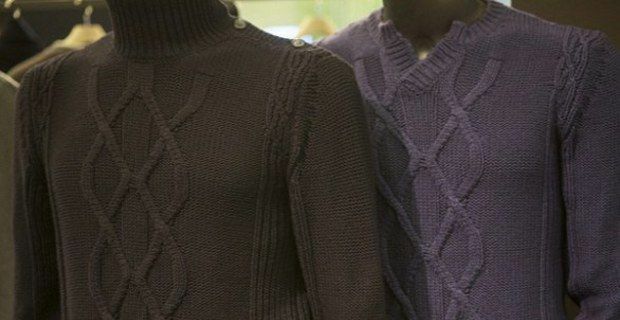 Thanks to the shiny fibres the sweaters are very soft, warm and available in various shades. Finally the luxury of natural fur is 100% animal friendly. At Pitti Uomo autumn-winter 2013-2014, the brand has also displayed its main collection, clearly inspired by Pablo Picasso, one of the most recognisable and influential painters. A clothing line featuring neat and elegant design which reminds of Paris at the beginning of the 1900s, with a predominance of dark and dusty colours, such as purple, dark blue-green, blue and slate. Annapurna took inspiration from Picasso's famous paintings "Two Acrobats" for its Harlequin sweater, "Portrait of Jaime Sabartés" for its blazer and knit combo, "Still Life with Liqueur Bottle" for its geometric jumper, and "Boy with a Pipe" for its man flower knit. At the new edition of Pitti Uomo Massimo Rebecchi presented a bohemian menswear collection for autumn-winter 2013-2014, which consists of many specially designed items for the man who wants to dress in a style that speaks the language of freedom. Iconic garment the bohemian jacket with camouflage print, latest trend for autumn-winter 2013-2014. The new Massimo Rebecchi's collection is designed for the urban contemporary man whose must-have piece of clothing is the jacket, which is worn on formal and informal occasions. The classic tuxedo jacket, has been revised with a modern twist and now boasts unique prints and details. The bohemian jacket reinterprets the traditional autumn-winter wardrobe offering a new military inspired style, which climax with its camouflage patterns. The lines and design are kept simple and basic to add a contemporary look, highlighted by the unusual black tie. The new Massimo Rebecchi men's collection revolve around the concept of freedom, it revives the nineteenth century's bohemian trend adapting it to the present. It's not just jackets, but also vintage-style, unstructured blazers with camouflage prints, sophisticated mohair and felted merino sweaters offered in autumnal tones, lighter jumpers in coloured stripes and geometric prints, creased and aged look tweed and wool suits, in mustard and sage. Also the latest trends, such as tartan and houndstooth fabrics, t-shirts, vintage bomber jackets in bright colours and carded wool Norwegian pullovers, which will be in vogue again next autumn-winter 2013-2014. During Pitti Uomo autumn-winter 2013-2014 Eton Shirts has introduced a very special limited edition, which bears the name of DNA collection. The line was designed to celebrate the 85th anniversary of the Swedish fashion house. The brand, which specializes in fine shirts, has presented a capsule collection featuring garments embroidered with the initials of Annie and David Pettersson, who founded and launched the company in the 1920's. The company states that “quality and attention to detail has been the heart of everything we do. We strongly believe that genuine craftsmanship combined with cutting edge weaving technology and a unique finishing process is our key to success.” Four collars are offered in this capsule collection, such as moderate or extreme cutaway and classic turn-down or casual button-down and the very strategic choice of double cuff to match modern suits.